Governmental mismanagement of the Michael Brown case in Ferguson has been astounding. Perhaps most shocking were the fires and looting after the decision not to prosecute Officer Darren Wilson. Governor Nixon had called out the National Guard a week earlier. Where were they? Nowhere to be seen. 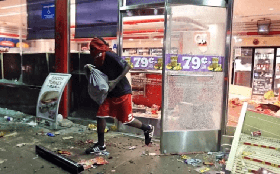 Had they been posted along the major streets of Ferguson, there would have been no looting or burning of 25 businesses after the Wilson decision was announced. Where were the Ferguson police? Walking slowly behind police trucks toward demonstrators as looters and arsonists operated freely. Within an hour dozens of buildings and two police cruisers were set on fire. Why are 50 of Ferguson’s police white and only three black, in a city that is two-thirds African American? Why were five of Ferguson’s six city council members white, and the mayor, a white Republican? In the last election for mayor and city council, only 6 percent of eligible black voters cast a ballot (and only 17 percent of whites). This is not due to black indifference, but rules set by the white establishment as to when elections are held. Election in Ferguson are on the first Tuesday after the first Monday in April in odd-numbered years. It is such an odd time, only a few of either race remember to vote. But three times the percentage of whites voted as blacks. So they won. In 2012 when President Obama was on the ballot, 54 percent of blacks voted – virtually the same as 55 percent of whites. It is time for civil rights leaders and black activists to press for a change in the date that local elections are held. If African Americans don’t like the justice they are getting in Ferguson, they must demand change. Need more evidence? In 2013 483 black people were arrested, but only 36 whites. However, white citizens are more often caught carrying illegal items like weapons or drugs – 1 in 3 whites vs. 1 in 5 blacks. If I were an angry black pastor or attorney in Ferguson, I’d run for mayor or city council on a platform demanding city elections be held in November, not April. In Thanksgiving week it is important to remember that one thing we can be thankful for is that in America we can “throw the bums out!” But not without effort or organizing. The white establishment will hold onto power as long as possible. However, change is possible. That’s what the Civil War and the Civil Rights Revolution was all about. Have Ferguson blacks read their history books? Don’t black leaders there recognize a responsibility to LEAD? I lived in Montgomery, Alabama in 1952 when an unknown black pastor called for a boycott of city buses since Negroes were required to stay behind a certain line in the back of the bus – even if there were no white passengers. Black maids began walking to white homes in the suburbs. Negroes with cars picked up as many maids as they could and my mother was one of the whites who drove to pick up our maid, Melzoria. However, I remember seeing hundreds of black maids trudging along, walking miles. Everyone had to sacrifice. It took more than year before the bus company, which was privately owned – went broke. It caved in, erasing the lines in the bus. Martin Luther King declared victory and made his national reputation in Montgomery and the Civil Rights Revolution began. By contrast, where were the black pastors in Ferguson after the decision was announced? They were as invisible as the governor, the mayor and the police chief – an indolent lot, all of them. The only folks with courage in Ferguson were reporters and producers who filmed the looting and the fires amidst hundreds of shots that were so frightening that firefighters fled. This Thanksgiving, count the free press as one of the things you should be thankful for. On the other hand, The New York Times published the town and the street where Officer Wilson lives. “I’m flabbergasted. It was terribly irresponsible,” said Howard Kurtz, a media commentator.